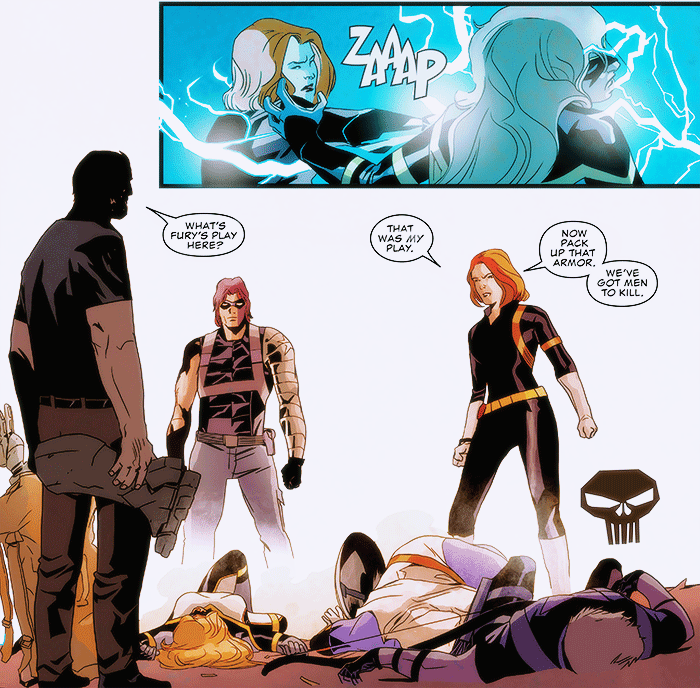 Bobbi: Nat, what the hell?! Frank: What’s Fury’s play here? Natahsa: That was my play. Now pick up that armor. We’ve got men to kill. So here’s the follow up to Tales of Suspense: Bucky and Natasha teaming up with Frank Castle to presumably kill a bunch of HYDRA agents to revenge Secret Empire. This is the last arc before the book relaunches with a more back-to-basics approach, so we’ll see where it actually goes. I’m not super in love with this even more brutal direction for Natasha— especially since that’s been, like, the last four directions for Natasha— but Tales of Suspense at least did the storytelling groundwork to make it believable. Sidenote: even more unsure about the white gloves and knee-high boots. From Punisher #226 by Matthew Rosenberg and Stefano Landini. Anyway, I’m a fan of street-level heroes and Marvel espionage stuff in general. This isn’t like, a secret. Of course I like Bobbi Morse, one-woman Birds of Prey. Bobbi’s inital arc in West Coast Avengers, where she had to balance her SHIELD agent instincts with her new superheroic role, hit a lot of my favorite tropes. I also love Bobbi’s surreal, only-in-comics backstory: not just SHIELD and the skrulls, but her science, her first appearances in the Savage Land. There’s this nifty baseline pulpiness with Bobbi that separates her from the archetypical spy mode, and so many stories Marvel could tell with her that they haven’t. It goes without saying that I’m really excited for this week’s Mockingbird one-shot. 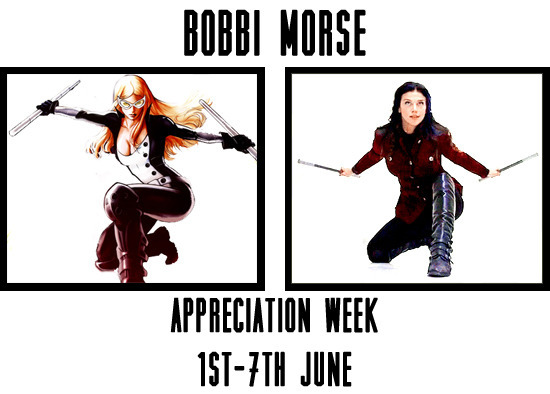 Bobbi Morse Appreciation Week is a chance to show your love for Bobbi through any medium you want to use – fic, art, graphics, gif sets, ficlets, and don’t worry if you’re not artistic because we love to read text posts about why people love Bobbi.